In this guide, you will learn how to create a custom user login email template that will be sent out every time you create a new Formyoula (non-Salesforce) user from the Users tab. To create a custom email template, please click on your name in the top right corner and select 'Setup' from the drop down list. Now when you are on your Setup page, please scroll down to the 'Organisation Details' section. Here you can create your custom Welcome email template. To rollback to the default email template please remove the custom template and leave the text area blank. Please use the following HTML structure for your email template to make sure lines are separated as per below example. 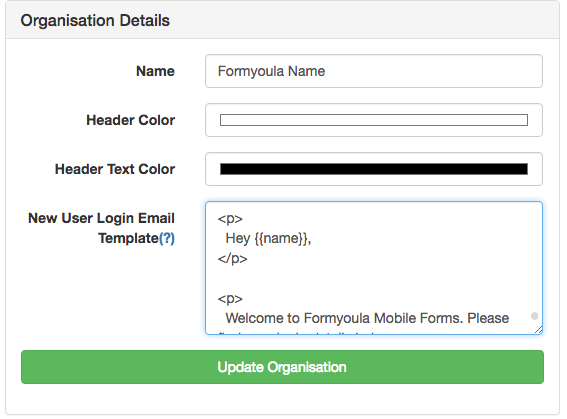 Welcome to Formyoula Mobile Forms. Please find your login details below.